First Edition of One Thousand. PEWTRESS & Co., 28, Little Queen Street, High Holborn, W.C.
KENT & Co., 23, Paternoster Row, E.C. 28, Little Queen Street, High Holborn, W.C. The first part of this little book consists of matter which originally appeared in the English Mechanic. It has been revised and re-edited by Mr. Wimshurst. I have to thank the Editor of the English Mechanic for freely and willingly placing the blocks for the illustration at my disposal. HOW TO MAKE THE MACHINES. The most useful size is probably that with 16 inch glass discs, and therefore the following remarks con­cerning the working details apply to that size. In order that reference may be made to each of the parts more Clearly than by the use of technical terms, an outline sketch is given on; which each part of the machine is lettered. Fig. I.
Stand.-For the stand is required a piece of mahogany, or any other suitable wood, 26 inches by 13 inches by 1 inch, it should be cut as shown in the diagram (Fig. 2). B B are the two sides; they are simply straight pieces with square ends, the edges of the upper side may be rounded to please the eye, the joints at the corners must be firmly held together by a long screw and glue-the mortises for the standards C C, and also for the insulating pillars g g, should be cut before the joints at the corners are finally made. the mortise, and be glued therein. Care must be given to get these upright and true. end of the spindle must be long enough to run in a bearing, and the other long enough to extend beyond the side of the stand sufficiently to take the handle. For the bearings of the spindle need only to be a small cleet of wood, screwed to the underside of stand is sufficient. E is a plain wooden handle. F F are the collars at the base of the insulating pillars; they are best made by putting a centrebit hole through a piece of mahogany, then cutting them roughly to circles, and finishing on a mandrel in the lathe; the shape should be tasteful. the upper ends hollowed out to suit the balls (H H), then a 1/4 inch hole should be drilled down the centre for about 2 inches in length ; the surface must be turned all over to remove any of the yellow stain fre­quently existing on the surface of the vulcanite, as the material forming the yellow stain is fatal to insula­tion. The finishing polish is made with whiting and water. H H are brass balls, 1 3/4 inch diameter, they can be bought as rough castings at Frost and Sons, Allan Street, Goswell Road; they require to be turned up to a smooth surface; the holes already through them should be used to take the tubes into which the terminals I-I fit; the ends of these tubes also project beyond the ball sufficiently to carry the collecting combs (K K). 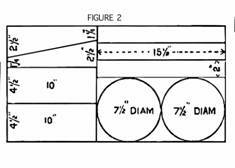 A hole must be drilled in the bottom of each ball into which pieces of 1/4 inch iron wire are screwed, and which form the chief attachment of the ball to the top of the insulating pillar, G.
beads;" they are made up as shown in Fig. 6; the' points I I I must be fitted into one another and soldered. J J are vulcanite handles, shaped to pleasure; a hole drilled in one end, and a little cement, attaches them to the wire of the terminal. K K are the collecting combs; they are made of bent wire; the ends of the wire should be curved inwards and pointed, the additional points may be added by drilling suitable holes and inserting lengths of a smaller sized wire; when finished the brass ball (H), the short length' of tube, and the collecting comb form a solidly connected part, as in (Fig. 7). L L are made of bent wire, and carry the brushes; at the mid-length is a tube which supports them and forms the axis upon which they move; it is sufficiently long to pass through the standard (C), into which it fits tightly; the ends of the steel spindle also fit into these. A small brass ball is soldered on the outer end by way of finish, the ends of the wire (L) are then rounded, and a small hole drilled up them to receive the brush, 'as in (Fig. 8). on the other end is turned the small V grooved driving wheel, thus (Fig. 9). 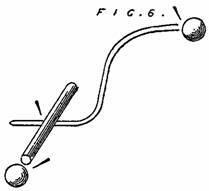 N is the spindle; it should be made from a length of polished steel wire, about 6/16 in. diameter. This and the 'tubes can be bought at Smith's tube warehouse, St. John's Square, Clerkenwell, and I must impress upon those who make a machine, that they cannot give too much care in selecting the tubes to fit properly upon the steel wire, and also where necessary, into each other; it will save trouble throughout the making, and the machine, when made, will work more smoothly. the centre should be 1 inch in diameter, they must be coated evenly, upon both sides with shellac varnish. end, the ends should be rounded; the best system of spac­ing and attaching them is to get a large sheet of paper, and upon it accurately set out the circles and the sectors, then place the glass over the paper, and the positions for the sectors will show clearly through the glass; 14 or 16 sectors will give about the most useful results. The sectors are attached to the glass with a little shellac varnish. Very pretty results are obtained by placing so many sectors upon the discs that the spaces between them are not more than a + inch wide; the sparks then jump from sector to sector in a rapid succession. Leather sewing-machine bands make good driving bands for these machines, but the leather boot-lace answers very well for machines of small size; the ends of the bands should be scarphed, and stitched together. Remember, the band to the front disc is worked straight, while the band to the back disc is crossed ; this arrangement causes the discs to revolve in opposite directions. into the hole which is drilled in the end of the carrier, and is therein wedged by a small wooden peg; when fixed, they ought to show about an inch length of free wires which affords sufficient spring to follow up the little irregulanties of the discs without causing percep­tible friction. The Stand.-For this is required two pieces of mahogany for the sides, each 16in. by 2 1/2in. by 1in. (Fig. I); two pieces for the ends 12 1/2in. by 3 1/2in. by 1in. (Fig. 2); two pieces tapering in width for the stanchions 10 3/4in. by 2 1/2in. 1 1/4in. by 1in. (Fig. 3); two pieces for the tables I0 3/4in. by 2 1/2in. by 3/4in. (Fig. 4); two pieces for the clamps which hold the driving spindle in place, '9 5/8in. by 1 3/4in. by 1in. (Fig. 5), and four pieces for the scroll feet, 6in. by 3 3/4in. by I in. (Fig. 6). All these should be planed up, the two sides should have a bold moulding cut upon their outer edges and ends, and the mortises cut in them; the stanchions should be fairly rounded upon their edges and tops, the tenons cut to properly fit into the mortises, and the scroll feet (Fig. 6) cut out with a turning saw to a pretty shape. Care must be given in shaping the latter so that they quite cover the ends of the tables which support the Leyden jars, since it looks ugly to show the end of this table. These parts may then all be glued together, and as they are chiefly surfaces glued to surfaces, screws should be used as well as glue, only making sure that the points of the screws do not show themselves through the top of the stand. The tables which support the jars have circular pins cut upon their ends, which fit into holes bored in the scroll feet, and they must be glued into place in their proper order. driving handle (Fig. 8) rests. Next bore a hole in a piece of mahogany, and drive the spindle into the hole, after which the spindle should be put back into the lathe, the mahogany turned, and its ends made to fit into holes, which must be bored in suitably large pieces of mahogany, which are to form the driving wheels. The spindle may then be trued up, and its ends finished; after doing this, glue on the driving wheels, and when dry turn them up. Let the groove be of good size, as the bands run better in large than in small grooves. If the mahogany is not tight upon the metal spindle, it will be desirable to bore a hole through wood and iron, and drive in a metal pin. Be careful that the driving wheels are about 1/2 inch free from the table. Clamps to Hold Spindle.-(Fig. 5.) They should be made sufficiently long to fit against the ends of the frame, the corner portion, which fits under the scroll feet, being cut out, the small pieces, which are cut out neatly, are to be glued in their places between the scroll feet and the sides of stand, and the clamps are then held in place, each having two screws. Holes for Leyden Jars.-The position of these holes should now be accurately 'marked, an'd the holes be bored 1 3/4 diameter. A good centre-bit will do this; but the holes must be quite vertical, and extend through the ends of stand, and about half through the tables. Spindles for Glasses and Tubes for Bushes.-The former must be of steel wire, 10 inches long and 3/8 inch diameter. When selecting this take enough length for two spindles. The second spindle will be found useful in many ways. So also with the tube, which is required to fit closely on the spindle. Select, say, three or four times the spindle length; it is useful for additional experimental bosses. The wire is so true that merely cutting the length of it and slightly rounding its ends will be all that is necessary. length of the brass tube into the holes, and then put them into the lathe and true up-first for proper length, and afterwards to a form, being careful to keep the V-groove over the V-groove of.the driving wheel. Driving Bands. - The round - leather for sewing-machines answers very well for this size machine. The joint is best made by cutting each end to scarph, letting the scarph overlap be about 1 1/2 inch long, and stitch together with needle and stout thread. Bottom Circuit for Leyden Jars.-This circuit is made by a small wire extending from the two Leyden jars on one end of the machine, and carried thence up to a terminal; the wire should, as far as practicable, be placed on the underside of the - several parts. It may be attached by means of small staples or by small tacks, the wire being twisted round the tack just before' it is driven close up. The other end of the machine is then similarly completed, and the circuit is then closed by means of a portable length of brass wire ,between the two terminals. Brass work Rods for the L eyden Jars.-Th e four rods for the Leyden jars (Fig. 9a) are made of brass tube, each being 12 long by 1/4 inch internal diameter. At 1 1/2 inch from the one end solder on a nicely-shaped brass ring, which forms the shoulder upon which the ball of the comb rests ; then polish up and lacquer. Combs.-These (Fig. 10) are made by first cutting a 12 1/2 inch length of 1/4 inch brass wire, the ends 'of which are to be rounded. It may then be bent to the U-shape as per drawing, then having got the four cast balls, surface them up, and see that the holes through them are large enough to very freely pass over the tubes. With a small round file cut on the one side of each ball a groove to fit upon the bent brass wire. Having done this, drill the holes and fit in the collecting points. Five on each side will be found to be sufficient. After this solder the brass wire, the points and the balls together, then polish up and lacquer. 16 1/2 inches long; file the one end a little taper, and on it solder the ball, bend to proper form, clean up, and lacquer. Neutralising Rods.-These (Fig. 12) are made of 1 3/4 length of tube cut from the same size as is used to bush the bosses. At a 1/4 inch from one end drill a 1/32 inch hole right through, and into this fit a piece of brass wire 18 1/2 inches in length, the ends of this wire' must then ,be drilled up (say 3/8 inch) to receive the brushes; solder the wire in place, at same time solder upon the end of the' tube a brass ball, to make a finish; polish up, then bend the wire to proper form and lacquer. The ends of the wire must be perpen-dicular to the surface of the plate. Brushes.-Get some fine wire, such as is made by the gilt-lace makers; a 1/4 ounce (costing 3d.) will be enough for several hundred brushes; then get a piece of metal plate, say 1 1/4 inch broad, wind upon it ten turns of the wire, take a knife, and cut the wire turns through at one edge of the metal plate, slide the partly-made brush off the plate, and with the finger-nails tightly twist up the uncut ends of the wire; now slightly pull and bend the wires till they lie straight. and clip off the sharply hooked ends with a pair of scissors. The brush is then complete. Driving Handle.-It is better to make a pattern for this, and have it cast in brass. It then only requires to be surfaced. The hole for the driving spindle should be screwed, and a wood case fitted over the driving pin. The L eyde jars. - They are IO 1/2 inches by 1 inch (Fig. I3). The tinfoil coating is about 4 inches in height upon the inside of the jar, and about 3 inches in height on the outside, besides which, on tlie outside of jar, is a band of leather, which takes the chafing of the hole in the end of stand, and through which the jar passes. at the foot of the tube, cement on a ring of wood, just large enough to enter the jar; coat this ring with tinfoil, so that it shall make the metal contact with the inner coating of the Leyden jar, then cement the top on to the jar, and lastly drop down each of these tubes small sticks of wood, of just sufficient length to touch the bottom of the jar with their lower ends, while their tops ends are at such height to carry the lower end of the discharging terminals; the balls on the discharging terminals must be kept high enough to pass over the tops of the glass disc. This provision is to avoid breakage through the balls striking the glasses. The Glass Discs.-These are made of selected window' glass; care should be given to the flatness and even thickness. The dark green-coloured glass, or some of it, appears to conduct away the high tension electricity; therefore select the whiter qualities. They should be cut upon a revolving table, and be 17 inches diameter, the hole at the centre being inch diameter. They must then be coated with shellac varnish upon both sides; this should be done in a warm room, and the plates dried by heat. Then set out a circle of the same 'size upon a sheet of cartridge paper, divide it into 16 or 18 parts, and at each division mark out the sectors; place the glass upon this, and then with a little shellac varnish stick on the sectors. The sectors should 'be 4 inches in length, 1 1/8 inch broad at the wide end, and 1/4 inch broad at the narrow end, the outer ends being placed 1/2 inch from the circumference of the glass plates. Then again place the glass upon the revolving table, and with a small brush make rings of shellac varnish-one at the outer end of the sectors, the second ring be'ing at the inner end of the sectors. These rings help to attach the" ends of the sectors, a'nd slightly insulate the extrcmities. bottle with shellac, and cover the shellac with methylated spirits, Occasionally shaking the bottle. in about 24 hours it is ready for use. The brush is then always quite clean and ready for use. THE WORKING OF THE MACHINE. First. How many sectors are upon the plates? If only 10 sectors, the machine is not self-exciting, unless it be in such an atmosphere as is usually found in an ordinary living-room ; but when excited 10 sectors upon each disc is perhaps the best arrangement for length of spark. With this number of sectors, and with good Leyden jars, the spark should leap through space equal to nearly half the diameter of the disc. With 12 sectors, the atmosphere may be a little less dry ; but with 16 or 18 sectors upon each disc, the machine will he freely self-exciting under almost every condi­tion of atmosphere ; while, if Say 40 sectors are placed upon each disc, it is only with difficulty, and under the very worst conditions of atmosphere, that self-excite­ment can be prevented. There are conditions under which this machine is not self-exciting ; the reason is that in an atmosphere saturated with moisture, everything, including the machine, is coated with a thin film of water, and as electricity of this character so readily travels through water, it is not possible to upset the normal condition of the sectors. surfaces had condensed vapour upon themselves, and then, after a few minutes, when they had acquired a temperature nearly equal tot he surrounding atmosphere, the condensed vapour was again taken up by the atmosphere. This experiment shows that the temperature of the machine must not be less than the atmosphere in which it works ; while to produce and to exhibit the maximum results, say, iii a lecture hall, the whole of the apparatus should be kept slightly warmer than the surrounding atmosphere. Then, again, the neutralising rods and their brushes are Important ; the metal brush must be in absolute metallic contact with the neutralising rod, and the brushes at each end of the rod must touch the sectors on opposite sides of the centre of each plate at the same time. If the rods are not of proper shape to cause the brushes to touch the sectors in this order, bend them to a proper shape. Much cannot be expected if the neutralising brushes are in wrong position. Take your watch, hold it by the chain, and let its back come to the spindle on which the discs revolve ; the neutralising rod for the front disc should then be parallel with a line joining XI and V o’clock, and the rod at the back of the machine, seen through the glasses must be on a line joining I and VII o’clock—that is, the two rods will make an angle with one another of 6o degrees. The above is about the best working position ; though if the machine does not seem to pick up its charge readily, the rods may be turned into a more horizontal position. brush is complete, except only that the loose ends will require to be clipped with a pair of scissors to remove the Jagged ends. Pull the old brush out, and place the screwed end the new brush into the hole at the end of the rod, and a small wooden peg squeezed in alongside the brush holds it securely in place. The balls on the discharging rods should be unequal in size to give the best results. To obtain the maxi-mum length of spark with, say, 17 inch discs, one ball should be about 3/8 inch and the other about 1 1/4 inch diameter. They should be very nicely polished. This arrangement also gives very good brush discharges. When the balls are of different sizes, attention must be given to make sure that the ( — ) or the ( + ) electricity is on that side of tile machine which will give the best results. This is readily done by slightly darkening the room and noticing on which collecting comb is the electrical brush, or which the luminous points. The difference is very marked. Having done this, then see that the larger ball is in connection with that comb which has the electrical brushes on its points. To reverse the current, where this is necessary, the better course is to charge a Leyden Jar from, say, the right-hand comb. Then close the discharging balls and with them closed turn the discs a few revolutions in the opposite direction ; then separate the discharging balls and touch the left-hand comb with the charged Leyden jar. The current will then be reversed. notice the results. Then get a pin or a needle, tie it on one of the wires so that its point projects away from the wire and from the machine, then endeavor to get the results which the machine formerly gave, and you will find the difference very marked. Next fasten a pin in similar way to the other wire or Leyden Jar, and try the result ; and you will see scarcely anything. It is a most useful experiment for amateurs, because it will so firmly fix in their minds the great importance of leaving no points exposed, and on the contrary will show the value of smooth surfaces. Dust.—Always keep your electrical machine free from dust ; each atom constitutes in some degree a point, and moreover, it forms in some degree a conductor of electricity. The foregoing points may each and all be as indicated ; nevertheless, the charge will not remain in the. Leyden jars. This condition is produced by a crack probably in one or more of the Leyden Jars, or the quality of the glass may be bad, and each one should be separately tested for insulation. If the machine be made up with vulcanite supports for the combs, each of them should be separately tested, for the surface of vulcanite decomposes, and which freely conducts away the electricity. Sparkling Plates—With forty or more sectors, and leaving the spaces between them about a 1/4 inch, very pretty results may be obtained ; the sparks jump from. sector to sector, and show quite a shower ; but to pro­duce this effect the discharging terminals and the combs are best removed. Adding the combs and the Leyden Jars, and allowing the discharges to take place from sector to sector, gives fewer, but very much brighter, sparks. four Leyden jars to make the supports for the combs ; nevertheless, they equally apply to the never form of machine. But to obtain the brush discharge, and for several other purposes it will be necessary with the newer form of machine to break the circuit between the outer coatings of the Leyden jars. This is readily done by removing the wire, which is fitted between the terminals upon the base or stand. The Bosses working too loosely upon the Spindle. When this occurs, you will probably find that a brass spindle instead of a steel spindle, has been used. A brass spindle, with brass bushes, soon causes chafing and looseness. The only cure for this is to get a suitable length of steel wire, just a little larger than the old spindle, and then put it in place of the smaller brass one. Having attended all these points, some one is pretty sure to say : There is an abundance of electricity, but it is all at the top and the bottom of the glass discs, and none at the combs. If such is the case, the direc­tions cannot have been followed. Turn the handle of the machine in the opposite direction, and you will then see that the electricity leaves the top and the bottom, and will be found at the combs. The cure for this is to see that the driving band at the back of the machine is crossed, and the front band the straight one, or the neutralising rods and their brushes are wrongly placed. The lower brush to the front plate should be under the right-hand comb, and the others in relation to it, as earlier described. Some say the newer form of machine does not give so long a spark or so good a brush as some other machines do ; but it must always be remembered that it is designed as a compact machine of great power to give good average results of every kind. THE INFLUENCE MACHINE.—A CON­TINUOUS ELECTROPHORUS. 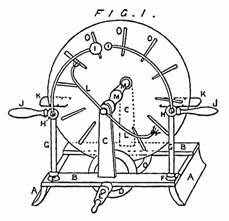 In the year 1753 John Canton was the first to discover electrical induction, and a few years later, in 1782, Volta made an electrophorus (see Phil. Trans., Vol. LXXII.). The next step appears, by the Phil. Trans., Vol. LXXVII., page 32, and Vol. LXXVIII., page 8, to have been made by Bennet, who then found that by using an apparatus practically con­sisting of one electrophorus placed on a second, and by varying their positions relatively to each other, &c., he could multiply the first induced charge. From the Phil. Trans., Vol. LXXVIII., page 405, we find that the next step was immensely in advance of all previous efforts. 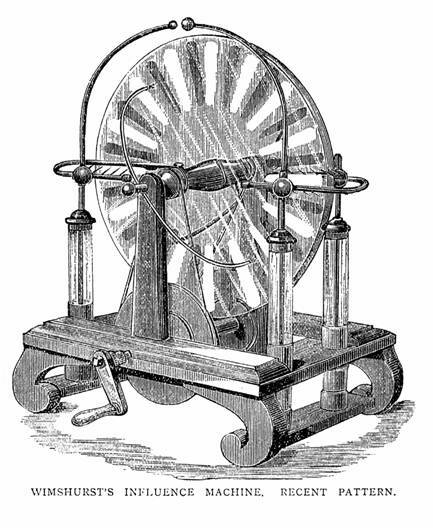 Both the electro­phorus and the condenser involved the tedious opera­tions of raising and touching the plates by hand ; but in Nicholson’s revolving doubler the principle of rotation, and the contact of wires took the place of these elementary processes. Nicholson multiplied the charge by using three metal plates, two of which were held in a horizontal position at the ends of insulating arms, while the third plate was made to revolve in front of the two fixed plates, the atmosphere answering for the dialectric, and each of the three plates being touched at proper times during each revolution by metallic brushes or contacts, by these means he obtained considerable charges of electricity, and pro­duced the first self-exciting electrical influence machine. Since then a century has passed away, and the infant of Nicholson has grown to the giant, the difference, however, between the Nicholson revolving doubler and the modern influence machine consists merely in the mechanical developments. small obtain which the greatest attention had to be paid to the atmosphere and to the tempera­ture of the machine ; while now, with the modern in­fluence machines, the temperature and the atmospheric condition are scarcely a consideration and instead of a small discharge at long intervals, the modern machines will display torrents of sparks, apparently in a con­tinuous stream. To confirm this last statement, I may add that two machines stand in my laboratory—either of which, when turned by a lad, will furnish discharges from Leyden jars so rapidly as to give sufficient light to enable me to write or to read. The theory which, perhaps, is most worthy of ac­ceptance is that, even when at rest, each of the sectors is in some degree differently electrified to its neighbors ; that when the machine is put in motion each pair of sectors in their turn touch the metallic brushes at such points or places, that the equalisation of their charges, and the corresponding changes of the electrical condition between the plates or discs, may produce the most useful effect upon the plate and its sectors at the back of the machine, which plate, it will he remembered, revolves in the opposite direction to the front plate. When the machine is working, it may be supposed that an electrical wave is set in motion, the depression (or — ) being seated on the one half of the plate, the crest (or + ) being seated on the other half of the plate, the normal condition extending in straight line from top to bottom of plates. The sectors seem to occupy the position of reservoirs, and contain the larger part of the electricity which is produced upon the adjacent surfaces of the plates or discs, for being of metal they readily accept, and deliver their acquired electrical charges. The above remarks contain the early history of these machines, and the outline of perhaps the best theory respecting them. To attempt further developments of the machines, and to complete the above outline of the theory, will form very useful occupation for younger minds of your many readers during the ensuing winter evenings. But now to describe the simple form of a continuous self-exciting electrophorus which is, of course, only reducing the influence machine to its least complicated form, and bringing it within the reach of every school student who chooses to give a few hours to its construc­tion. First, obtain a large-sized knitting-needle, then two large-sized cotton reels, the holes through which nicely fit upon the needle ; then obtain two smaller reels, fitting equally well upon the needle ; next buy two discs of glass of about 12 inches diameter, and having a small hole through their centres, varnish the glasses on both sides with shellac, and when dry stick upon one side of each disc about thirty sectors of tinfoil, the spaces between each of the sectors should be about one-eighth of an inch at the outer ends, and perhaps three-sixteenths of an inch at the inner or small ends ; then with a little tricycle cement stick the glasses upon the ends of the large cotton reels, in such a manner that the cotton reel is upon the face, or sector side of the glass, care being paid to see that the glasses run truly when revolving upon the needle or spindle. A small ring, made of cardboard, and placed between the centres of the two glasses, will give about the proper space between them, to allow them to revolve without touching one another. exhibit masses of electrical sparks leaping from sector to sector. Of course, more perfectly-finished instruments may be made, properly-turned bosses being used instead of the cotton reels, and the neutralisiug rods and brushes being made wholly of metal. The machines also may be better held by making up a simple stand having two stan­chions properly shaped to carry the spindle ; and in this latter shape the electricity may be collected from the plates by attaching a wire point to a Leyden jar, and then standing the jar with the point near to the revolving discs. For educational purposes, and for illustrating induction, these simply-made instruments are very useful ; but the student or the tutor must use his own judgment in adapting the instrument and its attachments to the purpose required of it. NOTES FOR AN HOUR’S AMUSE­MENT WITH AN “INFLUENCE” MACHINE. The Flow of the Current in this Machine. Are there two electricities, a “positive” and a “negative,” or, as they used to be called, a” vitreous” and a “ resinous? “ I believe most people hold that there are two. My researches over a long period coupled with many experiments with the “ Influence” machine of Mr. Wimshurst lead me to the conclusion that there is only one electricity. My experiments with that machine commenced with its existence, as I was one of those fortunate persons to whom Mr. Wimshurst gave one of the first machines he made, and I witnessed the making and completion of the first he made. The experiments referred to herein can be made with any pattern of “ influence” machine. instead of two, and that the uprights carrying the spindle arc carried up a few inches above the upper rims of the plates with a cross piece connecting them at the top, he will have a correct idea of the “ compound “machine I am using just now. The six neutralising brushes are supported by wires from the top cross piece and are connected with the six lower neutralising brushes by a wire encased in an india rubber tube running down the outer of the two uprights. The machine so arranged is known by me as ‘‘ No. 7 “ in my collection. The following observations are written so that any one possessing an influence machine can test them, and are free from all technical expressions, a great many of which, as commonly used in connexion with Statical electricity, are at times confusing and misleading. There is an established fact and, it is that the electricity we are dealing with flows from off a pointed wire in what is called a “ brush,” and flows on to a pointed wire in what is called a point. As, however, we use the term ‘‘ brushes “ for the fine wires at the ends of the neutralising rods in this machine, and as we use the word “ points” for the sharpened ends of wires and rods, I have for the purpose of clearness used the words “electrical brush “and “ electrical bead.” Wherever then an “ electrical brush “ appears at the end of a pointed wire, electricity is flowing off that point ; and whenever an “ electrical bead “ appears at the end of a pointed wire electricity is flowing on to that point. It is by means of these “ electrical brushes “ and “ electrical beads “ that the flow of electricity can be traced through this machine. the handle. I have marked this prime conductor as (B). ‘‘ Electrical beads “ manifested themselves on the points of the combs of the right-hand prime conductor which I have marked (C). These prime conductors both are necessarily very carefully insulated on var­nished glass canes, have no connection with each other, stand 2 ft. S in. away from each other, and ter­minate with large knobs. The smaller knobs on the outer ends of these prime conductors unscrew and disclose pointed wires. All connections and circuits are made by unscrewing the smaller knobs and placing over the wires a small india-rubber tube having a thickish copper wire in it. I never use chain for making con­nection with anything to be placed in circuit, but always a stout wire encased either in india-rubber or glass and thus prevent waste. The reader should bear in mind that in the whole of the following experiments I arrange the machine so as to keep the “ electrical brushes “ flowing on at the left-hand edge of the plates. ( 1.) Take a pointed wire not insulated, turn the handle of the machine, let the point of the wire be gradually brought near the conductor B, the result is that electricity will flow from the earth through the operator’s body, this flow is evidenced by the beautiful electric brush which extends from the pointed wire proving that the flow is from the earth to prime conductor B. (2.) Take the same pointed wire and bring the point gradually to the opposite prime conductor C, and a “ bead “ will appear on time point of the wire, thus showing that electricity is flowing from conductor C on to the point of the wire and through the operator’s body into the earth. (3.) Now take a knob of metal, in this case it is one of 1 1/2 inch diameter, insulated by a glass cane—in this case 14 inches long and well varnished, pass a wire horizontally through the knob and let the wire be pointed at both ends, and project an inch at each side of the knob. brushes “ in these experiments always flowing from prime conductor B on to the plates) place one of the points of the wire towards conductor B, and what happens is this, a ‘‘ head ‘‘ manifests itself on the point of the wire that is turned away from B, an ‘‘ electrical brush ‘‘ flows from the point which is turned towards B, showing that electricity is present in space, for it is flowing from space through the insu­lated hall, on to the prime conductor B. ( 4.) Go through precisely the same operation with regard to prime conductor C, when a “ bead “ appears on the point of the wire which is towards that conductor, and an “ electrical brush “ flows out into space from the point of the wire which is away from it. Deduction from the above.—” Therefore there are not two electricities but one only, it comes from space, is so to speak, sucked into the machine through the prime conductor B and its attachments, ejected again into space through the prime conductor C and its attach­ments. “ This of course only when there is no connec­tion between B and C to form a circuit. the cause of all this ; I am merely noting facts as they have become manifest. I am in the present paper not attempting to explain why or how the machine appears to draw in electricity at one side and send it out at the other, I am merely showing that it does so and that there are not two electricities but one only.) What happens with that one electricity is that in all the cases I have put an excess of it will by the action of the machine be heaped up via prime conductor C on a glass surface placed in connection with C, and a void will be created via prime conductor B on a glass surface placed in connection with B. (6.) Take now instead of one pointed wire con­nected with B, and one pointed wire connected with C with which we nearly completed the circuit, in the preceding experiment ; two pointed wires and two knobs, one pointed wire and one knob at the end of the wire from B, the other pointed wire and the other knob connected with the wire from C. As in the case of the preceding experiment complete the circuit nearly by placing them about 4 inches apart, so that the pointed wire in connexion with B shall be opposite to the knob in connexion with C and vice versa. Now if there were two currents of different electricities they would become apparent, but there is no sign of such a state of things. The fact is that from the point in connexion with C there is. 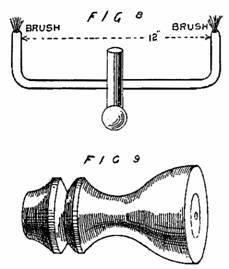 a beautiful “ electrical brush”” flowing to the ball in connexion with B, and on the pointed wire connected with B is a bright “ electrical bead”” showing the flow of electricity also into B from space and from the knob connected with C.
have a knob to place against the outside coating of the jar, and a point to bring towards the knob of the jar so as to get a silent discharge. What happens is this ( the knob of the discharger is in connexion with earth) and on bringing the point of the discharger gradually near to the knob of the jar, a beautiful “ electrical brush “ proceeds from the pointed wire to the knob of the jar. The flow is towards the inside of the jar, in other words there was on the inside surface of the jar a void, which, when the jar is discharged, is filled by a flow through the discharging rod from the earth. (8.) Now go through exactly the same process, only this time place the inside of the jar in contact with prime conductor C, the outside being connected with earth. Having turned the handle of the machine sufficiently, proceed to discharge the jar in due course, what happens this time is that on the point of the discharger is a bright head, the flow being from the inside of the jar to earth, showing that electricity had been, so to speak, heaped up this time on the inside surface of the jar. The same experiments can be made with the inside coatings of the jars in connexion with earth, and the outsides in contact with either of the prime conductors, but it is not necessary to occupy space by giving them. (9.) The Leyden Jar—A theory often propounded by experts in connection with the Leyden jar is that when the jar is charged, that is to say, when the inner surface has one sort of electricity on it the outer has the opposite sort of electricity on it, and when the inner surface has the other sort on it the outer surface has the one sort of electricity on it. As totally opposed to this view, I wish to submit that as a fact the outer surface must be always in a normal state when connected with earth. connection, and on the other of bursting the jars by having a heap of chain anywhere touching the outside surface of a jar ; by having a tinfoil table top to stand the jars on, the outside surfaces of all of them on the table are always in c connection. Working with a pair, this is a great advantage, but working with twelve or more the advantage of this arrangement cannot be overstated. But to proceed. The tinfoil top of my table is connected to earth by a chain to the gas main. What I mean when I use the term “ normal “ is, that state, electrically considered in which the chairs, tables, gas mains, atmosphere, &c., &c., are at the moment I am making an experiment. And no one will doubt that the top of the table and the gas pipes are in a normal condition, and of necessity it follows that the outside coatings of the jars placed on this table and therefore in metallic connection with earth, must in this view be regarded as “ normal.’ Further, whatever change may take place in the electrical state of the interior surfaces of two jars placed in circuit with this machine on this table no change electrically considered can by any possibility take place on the outside surface in one of a pair of jars that does not take place on the outside surface of the other, but the outside surfaces of both jars must always remain normal. There can be no ± and equally no — on the outside coating of either. The plates of the machine also are, if I am right, “ normal” until the handle is turned. If the above reasoning is sound, it follows that the outside coating can be dispensed with for the purposes of all these experiments. ( 10.) Having reasoned the matter out I removed the outside coatings of several of my jars, cleaned them carefully, and gave them two coats of good shellac varnish, and at the present moment I believe that my machine is the only influence machine working con­stantly with jars in circuit without any outside coating whatever except of shellac. At every discharge the jars appear to be standing in a nest of fire. hangs about the jar for some time : I have found after 36 hours. This residual charge is not however more than I find, when, instead of coating the inside of a narrow-necked bottle with tinfoil, I have put shot into it up to the height of the desired coating. I have used hock bottles in this way and they answer admirably for getting a long spark. When salt is used as an inner coating residual charges remain in the jar for days, and the jar itself is slow to discharge. (11.) “ Electricity “ is everywhere. The “ in­fluence,” or any other of the allied machines does not “ make “ it, or ‘‘ produce “ it. It makes it manifest, and is a means of collecting it for a time. A two wave theory is no longer necessary to satisfy the mind as regards heat, light, or sound. Why should a two wave theory be longer necessary to explain statical electricity? At all events, I submit that the doubting stage of the “ two fluid “ theory ought to have arrived. and always readily drawn from earth and space sur­rounding the earth and made evident by the “ influence” of this machine. (13.) It may be of interest to record the lengths of sparks obtained from my machine No. 7. They are as follows :—Without any jars in circuit, a continuous flow of 6 1/2 inches ; with two condensers in circuit, similar to the condensers usually fitted (Fig. 13) with the Wimshurst machine, 8 inches ; with two condensers made of pint-and-a-halt Hock bottles, having shot for the inside coating and 2 1/2 inches of tinfoil for outside coating, 10 3/4 inches.